Holy hell. Finally a book written in the 20s. -M.R. Uncomfortable Plot Summary: Ernest Hemingway recounts his exploits disguised as fiction. First Sentence: In the late summer of that year we lived in a house in a village that looked across the river and the plain to the mountains. I read For Whom the Bell Tolls a few years ago and mostly came away from it with the feeling that I really don't know anything about Spain. Also the book was quite a bit of a slog, so I'm relieved to report that A Farewell to Arms is quite a bit better. Like, way better. But it also makes it extremely clear why Hemingway is considered a misogynist. The book is the story of Lieutenant Frederic Henry, who is, for some reason, an American driving ambulances for the Italian army during World War I. (I'll tell you right now, it took me an embarrassingly long time to remember that the Italians were Good Guys that time around.) Henry meets an English not-quite-nurse named Catherine Barkley, and then gets injured. Catherine ends up caring for him in the hospital, and Henry ends up caring for her in the hospital by getting her pregnant. (I saw a Hemingway biopic called In Love and War about a million years ago starring, no kidding, Chris O'Donnell in the lead role, that basically fictionalized the real-life version of this story. Y u so semi-autobiographical, Hemingway?) The ordeal of the story is basically Henry and Catherine's effort to stay together during wartime and also a time when unmarried women really weren't supposed to be having babies. "And that's it?" Catherine said. "She says just what he wants her to?" "But I will. I'll say just what you wish and I'll do what you wish and then you will never want any other girls, will you?" She looked at me very happily. "I'll do what you want and say what you want and then I'll be a great success, won't I?" "What would you like me to do now that you're all ready?" "Come to the bed again." "Oh, darling, darling, darling," I said. "You see," she said. "I do anything you want." "I'm afraid I'm not very good at it yet." "I want what you want. There isn't any me any more. Just what you want." "I'm good. Aren't I good? You don't want any other girls, do you?" "You see? I'm good. I do what you want." I hope I don't have to explain why that passage makes me a bit uncomfortable. Catherine doesn't really seem like a fleshed out person, just a sort of beautiful fantasy creature. I'm also not going to pretend that that ruined the book for me, though. There's strong stuff in it, Hemingway being, after all, the manliest of manly men. The style took a bit of getting used to (see a probable upcoming post on the topic for a more thorough discussion of this), but after that I had no problem with it. 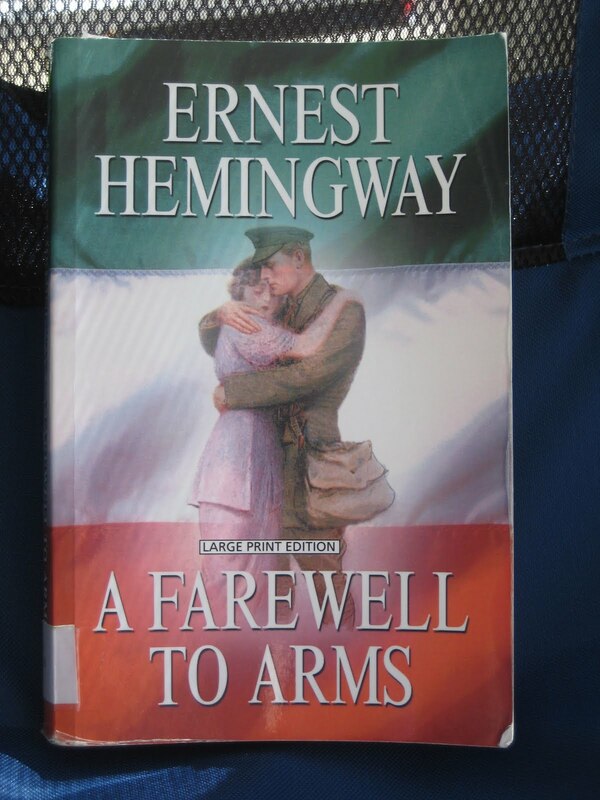 Ironweed was a little bit like this, although Hemingway is a more masterful writer than Kennedy, conveying everything he needs to in spite of his sparseness, at least emotionally. I found most of the actual action really dry, though. There are further Hemingway novels ahead on The List, but for the time being I'll say that this one is well worth a read, long before I'd recommend picking up For Whom the Bell Tolls. "I wish there was some place we could go," I said. I was experiencing the masculine difficulty of making love very long standing up. "Yes," said Gino. "But those were Frenchmen and you can work out military problems clearly when you are fighting in somebody else's country." "Yes," I agreed, "when it is your own country you cannot use it so scientifically." "The Russians did, to trap Napoleon." "Yes, but they had plenty of country. If you tried to retreat to trap Napoleon in Italy you would find yourself in Brindisi." "A terrible place," said Gino. "Have you ever been there?" "I am a patriot," Gino said. "But I cannot love Brindisi or Taranto."